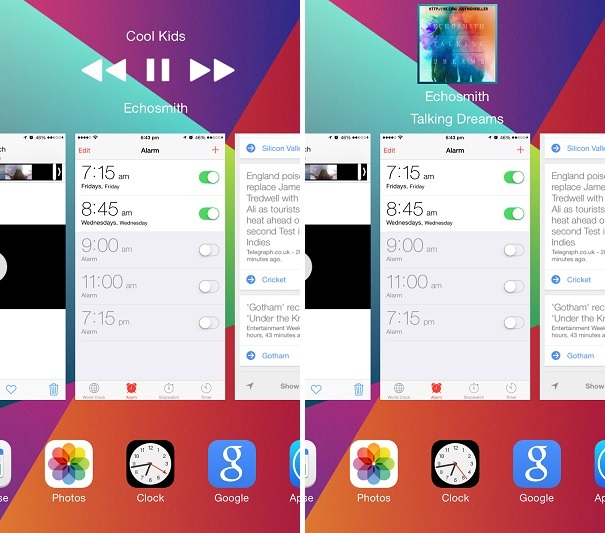 The new Muswitch tweak for jailbroken iOS devices brings lockscreen like music controls to the App Switcher. This means you will now be able to access the basic music controls and album information of the currently playing song when switching apps. The tweak removes the favorites section of the app switcher that was added in iOS 8 while only showing the control when there’s music playing in the background. Rest of time the area above app cards remains empty. The music controls that are added to the App Switcher allow users to play/pause and switch to previous or next songs in the playlist. Additionally, you can see the album name and artwork as well as name of the song by swiping left on the controls section. Muswitch works with the stock Music app as well as most third-party applications including Spotify, Overcast, Safari and more. Muswitch also supports the landscape mode of the App Switcher. As it is a simple tweak there are no settings to configure. You will see the new music controls on the multitasking screen right after installing it on your device. The tweak supports both iOS 8 and iOS 7 and is available in Cydia for free. It works with all iPhone and iPod touch models.